Marianne’s 5 Minute TOPs are recordings with short exercises that will give you “Training through Oral Practice.” These exercises are based on famous quotes or lyrics from well-known songs. Doing these 5-minute exercises either in class, at home or work will quickly enable you to memorize these structures to be able to make up personal sentences that express your ideas. We are currently introducing excerpts from the songs in the exercise so that you can practice singing, an excellent way to improve your speaking skills. These additions will make the podcasts a little longer. Marianne welcomes suggestions from her listeners for future podcasts. Go to our store to check out the available written materials such as the scripts of these episodes. TOP 1: "To be or not to be"
TOP 2: "I have a dream"
TOP 3: "She loves you"
TOP 4: "I’m a dreamer"
TOP 5: "I’m still standing"
TOP 6: "We are the champions"
TOP 7: "I heard it through the grapevine"
TOP 8: "There she stood"
TOP 9: "I’ve had the time of my life"
TOP 11: "Do you want to know?" TOP 12: "You made them laugh"
TOP 13: "Make love not war"
TOP 14: "Don’t worry be happy"
TOP 15: "Let’s do it"
TOP 16: "I will survive"
TOP 17: "Let me love you"
TOP 20: "Music Quiz 2"
More TOPs coming up soon! Write to us if you have special requests. 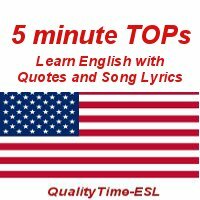 A new "TOP" to help you understand spoken English through "Training with Oral Practice" based on quotes and song lyrics. This episode is based on one of my very favorite song by U2. Add music to your English lessons with an MP3 podcast. "Get Lucky" by Daft Punk, one of my very favorite songs, is the theme of this episode. A new "TOP" to help you understand spoken English through "Training with Oral Practice" based on quotes and song lyrics. TOP 3 gives ESL, EFL, ELT, IELTS, Cambridge FCE, CAE, CPE students and learners oral practice using famous lyrics. Quotes and lyrics come from: She Loves You - The Beatles, Everybody Loves Somebody Sometime - Dean Martin, Everybody Needs Somebody To Love - The Blues Brothers, When a Man Loves a Woman - Michael Bolton, He Still Loves Me - Beyonce (The Fighting Temptations Movie). A new "TOP" to help you understand spoken English through "Training with Oral Practice" based on quotes and song lyrics. This episode is based on one of my very favorite songs by ABBA. A new "TOP" to help you understand spoken English through "Training with Oral Practice" based on quotes and song lyrics. This episode is a musical and memory quiz.